1945 Bordeaux wine deserves its well earned fame. Of course, the fact that it’s the victory vintage, following the of World War 2 only added to its legendary status. 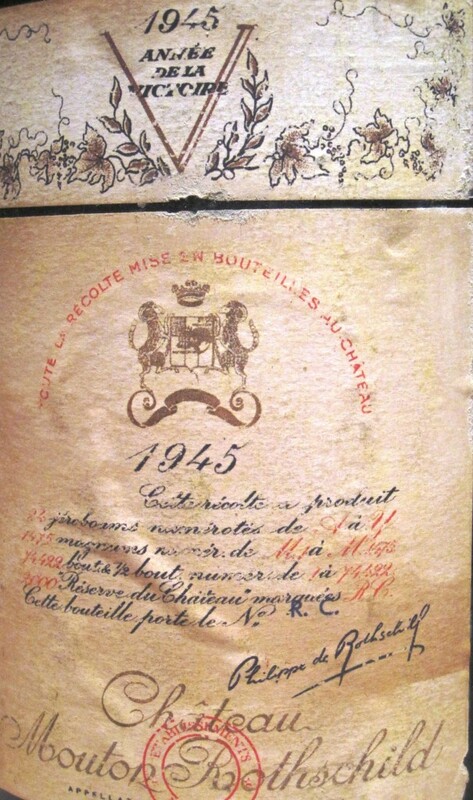 The close of World War 2 spawned the idea for the famous artwork pictured on the famous 1945 Mouton Rothschild, which many experienced tasters consider the wine of the extraordinary vintage. The deep, winter freeze helped reduce yields naturally which added immense concentration to 1945 Bordeaux wine. Growing conditions were close to perfect from start to finish. The 1945 Bordeaux growing season was warm, sunny and dry. In other words, perfect! For July, there were numerous heat spikes that made it all the way up to 98 degrees on July 21. In August, the month was perfect, with cold summer nights that dropped down to 49 degrees and ratcheted up to between 89 and 90 degrees for several days at the end of the month. In September, the entire month remained warm and dry, with temperatures that rose to 98 degrees September, 17. It did not begin to cool down until October, with the highest recorded temperatures reaching to 82 degrees October 11. By then, the 1945 Bordeaux grapes were already being vinified. The 1945 Bordeaux harvest took place under drought like conditions, which insured naturally low yields of very concentrated berries. Interestingly, the harvest in 1945 was an early harvest, which started on the same date as the equally legendary 1982 vintage, September 13. The wines began life with massive levels of tannin and took decades to develop. Due to the high tannin levels, many of the wines still show well today. 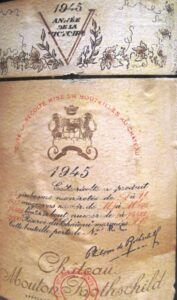 The best 1945 Bordeaux wine came from the Medoc, as well as Pessac Leognan. There were a few stellar wines produced in the Right Bank, especially Pomerol. The best 1945 Bordeaux wine from the Right Bank came from vineyards located on the Pomerol plateau; Petrus, Lafleur, Trotanoy, Vieux Chateau Certan and others are said to offer a stunning tasting experience as they march to their 80th birthday. Due to the ability of 1945 Bordeaux wine to age and evolve, many of the top wines could be even better when they hit one hundred years of age! But overall, 1945 Bordeaux wine favored the Left Bank and Graves.